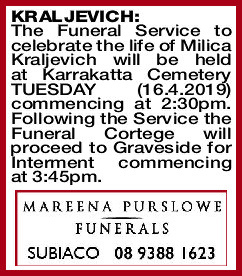 The Funeral Service to celebrate the life of Milica Kraljevich will be held at Karrakatta Cemetery TUESDAY (16.4.2019) commencing at 2:30pm. Following the Service the Funeral Cortege will proceed to Graveside for Interment commencing at 3:45pm. Our darling Mama passed away suddenly and peacefully aged 102 years on Sunday 7th April 2019. All through our lives you gave us your unconditional love and commitment. We could always find comfort in your arms. You were our rock and our courage. You showed us respect and shared your wisdom with us. You were always there for us and we will miss you so much Mama. You will live in our hearts forever. How blessed we were to have had you as our Mum. Your loving family and mother to Del, Anka, Julie, Marko and mother-in-law to Mark, Wilfrid, Colin and Rose. Loving Baba to grandchildren Kim, Nicola, Christian, Nicholas, Luka and Tom. Dearly loved sister-in-law of Pauline and much loved sister of Petar (dec). Loved aunt to Lazar, Drina, Andria and Jovan. Our deepest sympathy to Marko, Delva, Anka and Julie on the loss of your wonderful mother. Pauline Radanovich. Loving and devoted to all her family and friends. Deepest sympathy to Delva, Anka, Julie, Marko, the grandchildren and the families. There are those who were born and would always remain throughout their lives beautiful, kind and special. You were one of those Tete. 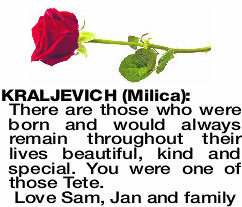 KRALEJEVICH MILICA Loving and Kind in all her ways. Friend and confidante to young and old. Your warm hospitality was second to none. These are the wonderful memories you leave behind. A tribute and farewell to a very special lady. Deepest sympathy to Delva, Anka, Julie, Marko and extended families on your sad loss. Fond memories last forever. God bless. Freddy.